Each time a cigarette is smoked, chemicals are released into your body that make the blood vessels "sticky" encouraging fatty deposit build up (atheroma) in the arteries called atherosclerosis. This may progress to clot formation which may in turn lead to angina and a sudden heart attack. As a matter of fact, Smokers are twice as likely as non-smokers to have a Heart attack. Fortunately, this risk is cut in half five years after quitting and after 10 years falls to the same level as someone who has never smoked. Smoking is the most common ca.use of COPD (Chronic Obstructive Pulmonary Disease). COPD describes a group of conditions such as Emphysema and Chronic Bronchitis. In these conditions, the airways of the lungs are narrowed so breathing becomes difficult. There is no cure but symptoms can be alleviated. Passive Smoking or involuntary smoking occurs when non-smokers inhale other peoples smoke and it is detrimental to the health of non-smokers. Smokers should realise that in addition to causing themselves harm, others may suffer as a result. Immediate effects on others include coughing, headaches, nausea, sore thrOat and eye irritation. 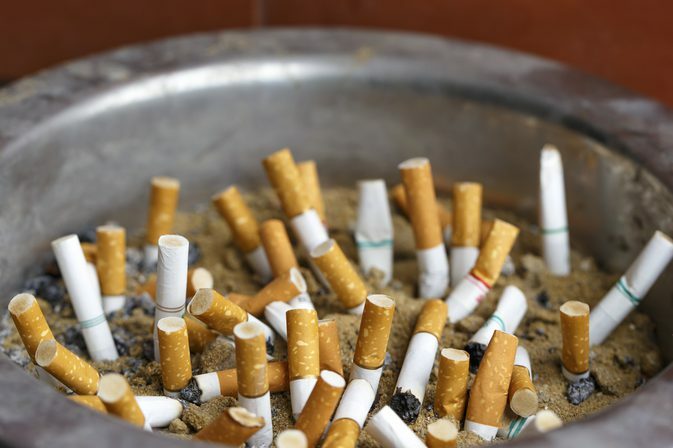 Individuals .are also at risk of developing smoking-related dIseases such as cancer, heart disease and stroke. stunted physical and mental development up to the age of 11 years. On the average Women have a lower risk of developing heart disease than men but smoking will seriously increase their chances of developing it. Women who take oral contraceptive pills which already ha~e a slight risk of developing str~ke or heart disease increase the risk even more If they smoke as well. Osteoporosis (thinning of the bones) is also associated with smoking. Smokers are more likely to develop a condition known as Age-related Macular Degeneration (AMO) which may lead to . Blindness. The macula is an area of the retina at the back of the eye important for central vision and distinguishing colours. If you are still healthy it is very important to stop before you get a smoking-related illness. It is even more important to stop if you're Overweight, don't Exercise or if heart disease runs in your family. If you have Just had a heart attack, it is in your interest to stop. This gives a very good motive to stop. How to Stop Smoking Some people find it easy to stop w~ile ?thers find it very difficult. TIle important thmg IS to plan in advance to stick to the decision. Stopping like this after a period of preparation is the best way as it has been seen that people who stop gradually don't often succced. .
nicotine patches and chewmg gum. Apart from the devastating health problems associated with smoking I find it hard to understand why anyone would want to go around with Bad Breath and Dull Sallow Skin? Smoking can accelerate the normal aging process of your skin, contributing to wrinkles. These skin changes may occur after only 10 years of smoking and are irreversible. Smoking leads to wrinkles by causing the narrowing of the blood vessels in the outermost layers of your skin. This impairs blood flow to your skin, depleting it of oxygen and Important nutrients such as vitamin A. Smoking also damages collagen and elastin which are the fibres that give your skin its strength and elasticity. As a result, skin begins to sag and wrinkle prematurely. In addition, repeated exposure to the. heat from burning cigarettes and the facial expressions you make when smoking such as pursing your lips when inhaling and squinting your eyes to keep out smoke may also contribute to wrinkle formation.